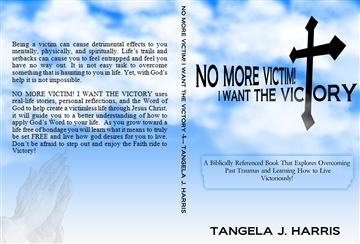 No More Victim! I want the Victory! Tangela Morris (m. Harris) has been an author since 2008. She is a graduate of the University of West Georgia (2004) with a BA in theater and a graduate of Capella University (2012) with a MS in Mental Health Counseling. Additionally, Tangela crossed over into Ministry in February 2012 when she became a licensed Minister. She is currently working as a mental health professional in the area of therapy and community support. Tangela is the co-founder and LIFE coach of Ladies In Full Effect (since 2005), a community outreach, enrichment, and mentoring program. She spear heads the organization with her sister, Tiffany DeWalt. Tangela enjoys writing, directing, and interacting in her community to help children and families. Her writing includes her relationship with Christ while teaching others more about Christ as well as helping others improve their lives through the word of God.